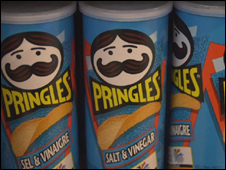 Procter & Gamble will be forced to pay tens of millions of pounds in VAT after losing a legal battle with the taxman over its Pringles snack. The Court of Appeal ruled in favour of the Revenue, which has long maintained that Pringles constitute a potato snack and are, therefore, liable for VAT. A High Court judge ruled last summer that the snack was exempt from the tax. Foods are usually exempt from VAT, but one of the few exceptions is the humble potato crisp. A High Court judge ruled last July that Pringles' packaging, "unnatural shape" and the fact that the potato content is less than 50% meant the snack was exempt from VAT. The Appeal Court judges disagreed. "There is more than enough potato content for it to be a reasonable view that it is made from potato," said Lord Justice Jacob. Potatoes make up 42% of the Pringles' ingredients. He added that the lawyer acting for the Revenue advised him the VAT due on the sale of Pringles was "as much as £100m of tax for the past and about £20m a year for the future." But a spokesperson for Procter & Gamble said the company had been paying VAT on the snack pending the appeal process, and so was not liable for any back taxes. While praising the "simplicity and common sense" of the judges, Toby O'Reilly, director in indirect tax at Ernst & Young, said an opportunity had been missed to provide "coherent guidance" on which snacks are, and which are not, subject to VAT. At last year's High Court hearing, Procter & Gamble insisted that their best-selling product was not similar to potato crisps, because of their "mouth melt" taste, "uniform colour" and "regular shape" which "is not found in nature". It also argued that potato crisps - unlike Pringles - did not contain non-potato flours, and were not packaged in tubes. Pringles are more like a cake or a biscuit, it claimed, because they are manufactured from dough.